No matter the medium: books, video games, manga or anime, I love grand tales of adventure, from the quest to destroy the One Ring in The Lord of the Rings, to saving Hyrule over and over in The Legend of Zelda games. Made in Abyss falls into the same category as these famous properties, setting two vulnerable characters off on a grand adventure, which may seem light and fluffy at the beginning, but ends up being a perilous adventure with a lot more going on than you first realise. The series is centred around a deep hole in the earth, known as The Abyss, that is full of wonderful and deadly creatures, rare resources and strange artefacts. Layered and unfathomably deep, each level presents a new challenge to anyone who dares venture down – from the dense forests of the second layer, the labyrinth of tunnels that snake their way around The Great Fault, to the steam-filled Cups of Giants and the lair of the frightening Orb Piercer. Couple all of this with the mysterious “Curse of the Abyss”, a kind of extreme decompression sickness which produces all sorts of strange effects, and The Abyss becomes the most challenging and fascinating environment on Earth. Not to be deterred by a bottomless pit, humans have been coming to explore The Abyss for many years, eventually forming an entire culture around it known as Cave Raiding, and establishing the city of Orth at its top. For the people of Orth, Cave Raiding is their lifeblood, and those who venture into The Abyss are seen as leaders and heroes as they are ranked depending on experience. This is measured by the whistle that the Cave Raider carries, going from a simple bell to whistles of red, blue, moon (purple), black and the most advanced, white. Our heroine, Riko, is the twelve-year-old daughter of a White Whistle, Lyza the Annihilator, who left the city of Orth at the top of The Abyss to embark on an adventure to reach its bottom. When some fellow Cave Raiders bring up Lyza’s whistle and research notes, the elders of the city believe her to be dead. However, a mysterious message reading “I’ll be waiting at the bottom of the Abyss” puts faith in Riko that her mother is still alive. With that belief and the support of a strange robotic boy named Reg who previously saved her from a Crimson Splitjaw attack, Riko escapes from the city’s orphanage and descends into The Abyss to search for her mother. 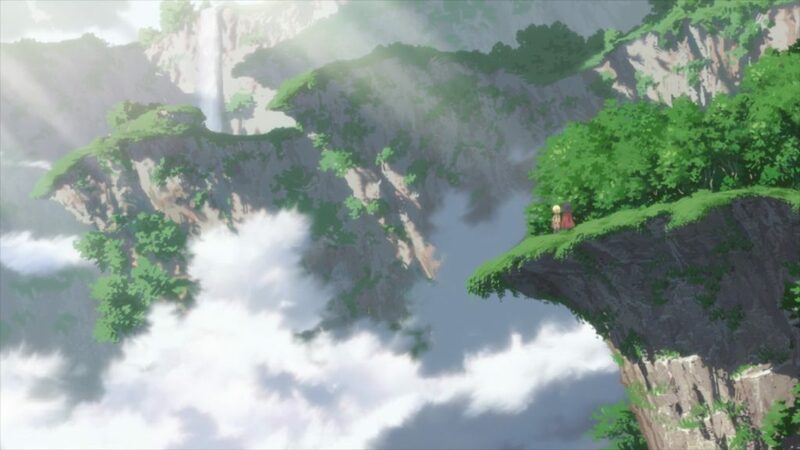 Although we don’t see the world of Made in Abyss with our own eyes, I still felt deeply immersed in it looking through Riko and Reg’s eyes thanks to the way it gradually builds in history, lore and culture, and shows The Abyss as a living, breathing thing. While there are definitely decent slices of exposition, the series does a good job of making it as natural as possible, making a point of showing rather than telling as our two leads interact with the world around them. For example, shots revealing how expansive the city of Orth is show that humans have been around this pit for quite some time, and a lot of what can be brought up from The Abyss does seem human in origin. 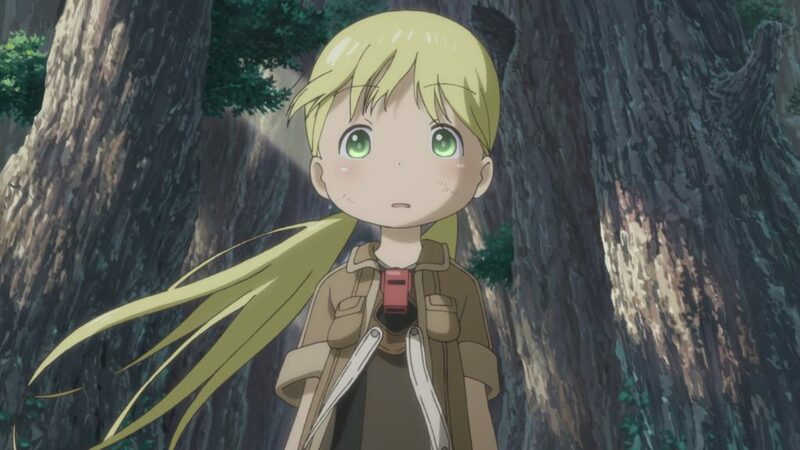 This extends to The Abyss as well, as while there are explanations on how The Abyss is structured and how things like The Curse work, we as viewers discover more about it through Riko and Reg’s actions, as they rush through rolling hills, forests and caverns, frequently getting on the wrong side of the creatures that make The Abyss their home. Here we get to see a very rich ecosystem, as changes in the available level of sunlight and the effects of the curse dictate a struggle for survival among the creatures living here, meaning that the ones further down have much wilder and colourful designs compared to those at the top. For every cutesy, docile creature, you’ve got many others which are much more deadly. 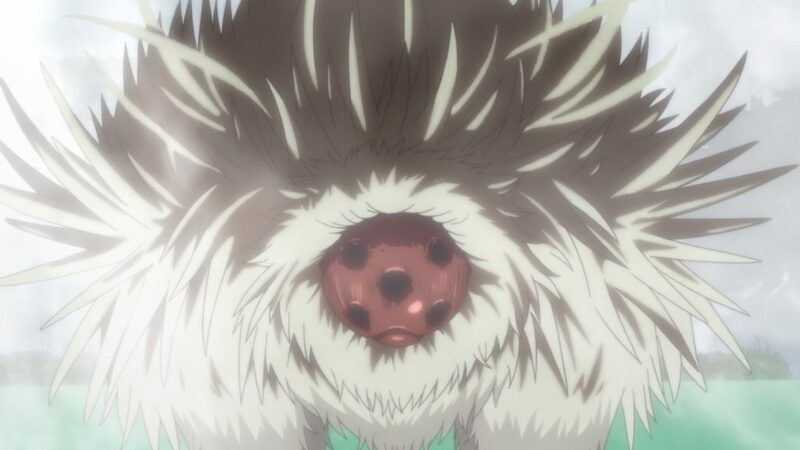 There’s an air of fantasy to the designs but they still have realistic aspects: the Orb Piercer for example is clearly based on a porcupine, while another is essentially a massive carnivorous plant. Having that element of reality makes the danger seem more real and threatening, as you know better what exactly they are dealing with. The action when dealing with these creatures blends in rather well and just feels part of the adventure. More often than not, it’s more running away than actually fighting something as Riko can’t really fight and Reg can only use his laser beam weapon sparingly. So, there’s a lot of movement and things happening; and in some cases, it feels like you’re rushing down a big waterfall with them as they end up speeding from encounter to encounter. This means you’re taking in a lot of the world at a fast pace, and while this would seem to go against showing the world of The Abyss, it actually manages to do it really well with some great visuals. The greater value here is in the jump from page to screen as it can really expand beyond the manga, giving us lush, full-colour, expansive environments. There’s a lot you can show more effectively in a moving image than a static one: the steam rising from the Goblets of Giants being one that particularly comes to mind. The cute and warm art style it uses really provides an interesting juxtaposition when things get serious, and while it does wear off after a while, it still reinforces the fact that the series is essentially two kids adventuring down this massively dangerous hole in the ground. Outside of this core premise, you have a very character driven story, and while it seems slow to start at first, the series needs this time to build in character backstories and motivations that are central to the plot. 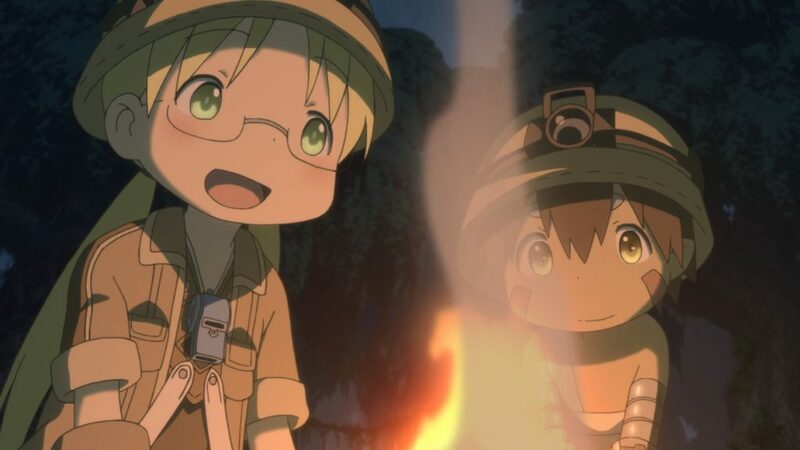 Early on this focuses more on Riko and Reg, with the show explaining at some length where Riko comes from and giving a hint to Reg’s origins and his connection with Riko’s mother. Riko as a character is really charming though and easy to bond with. She’s courageous and excitable with a head for adventure; always wanting to do more and go further than the rest of her friends. Reg is more subdued and more of the worrying kind, and often has to get Riko out of trouble, as he’s a multi-purpose robot/android, while she’s a weaponless human. As we move further into the series, more focus is given to the elite white whistles, who appear to be instrumental later in both this anime series and the original manga. 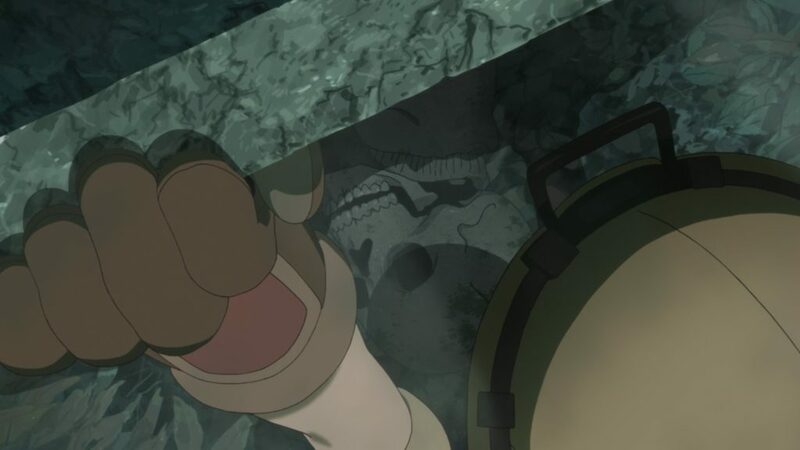 A large part of the middle of the series deals with the white whistle known as Ozen and her relationship with Riko’s mother. Ozen soon became one of my favourites with her darker and more mysterious personality. You quickly discover that the characters shown here are well constructed with strong, multi-faceted personalities that make them seem very human. 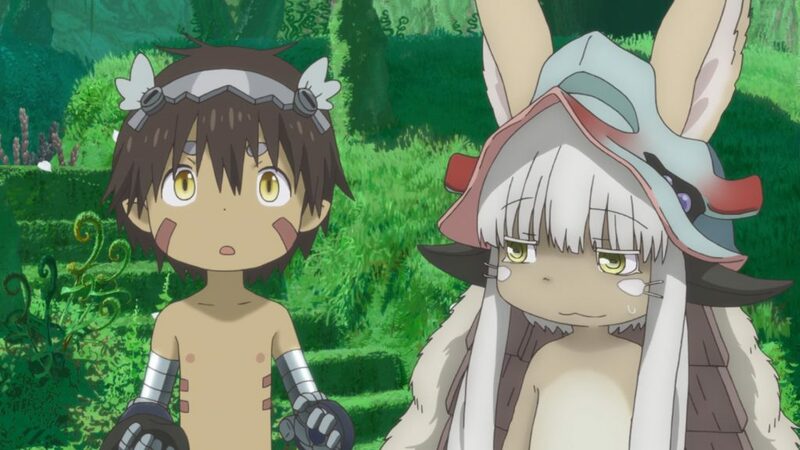 This feeling becomes more important later with the introduction of Nanachi as the series starts to take some surprisingly dark twists and turns towards a moving final beat of a substantial arc. 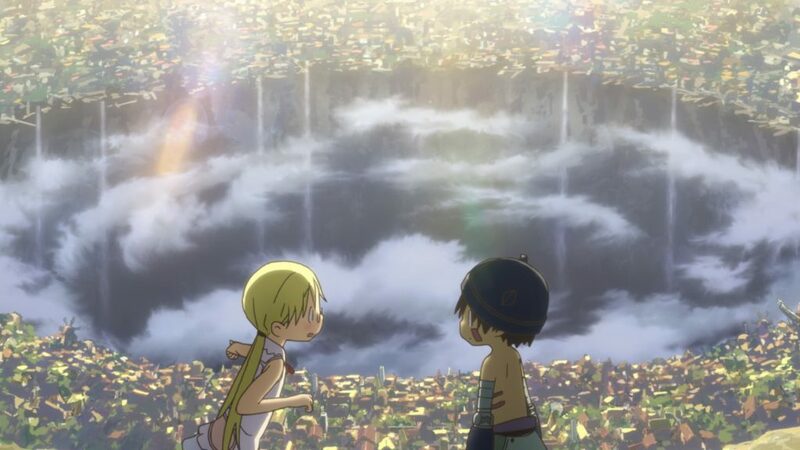 This twist is an example of just some of the other things going on around Riko and Reg’s journey, and while some of them work, there are others that don’t – occasional jumps back up to Orth break that immersion from the world of The Abyss, and I can’t see how this particular plot line has anything to do with the central story. It’s a blip, but only a small one in the grand scheme of a solid and really enjoyable series. Speaking of blips (and bloops), the soundtrack for the series is one of its most enjoyable aspects, featuring sweeping and delicate orchestrations and a range of more gritty and threatening tracks with liberal use of synthesised instruments. You’ll notice quite a few key themes that crop up through the series to punctuate certain types of scenes, but it’s very varied, deep and really sticks out in the overall audio mix. There’s a couple of vocal tracks too. The track that plays over that sunrise scene in Episode 1 – Hanezeve Caradhina (ft.Takeshi Saito) – is pretty incredible when everything is put together. 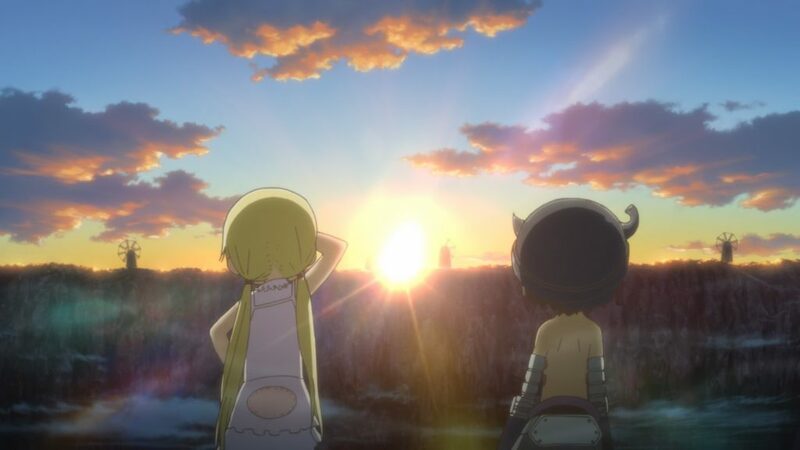 Where a lot of anime soundtracks use Japanese composers and music production agencies such as Elements Garden or onetrap for example, Made in Abyss takes a rare step out into the world with its soundtrack being composed by Australian Kevin Penkin and recorded at Synchron Stage in Vienna, Austria. It’s definitely good to see international talent in this area, even if Penkin has worked with Kinema Citrus before on Norn9. Although I had not heard of him before now, this is definitely one of the strongest anime soundtracks in recent years and it’s no surprise that it’s an award winner. I’d love to hear more from him and hope he continues to do anime-related work in the future. With this being a more fantasy-inspired work, both the Japanese and English dubs work well. Mariya Ise and Miyu Tomita put in strong performances as Reg and Riko, with Ise in particular playing her character so well it’s hard to tell it’s a grown woman voicing the character. Otherwise you have quite a familiar cast with popular voice actresses such as Aki Toyosaki, Eri Kitamura and Maaya Sakamoto getting some key parts, while Shirori Izawa lends her gravelly voice to Nanachi which fits the character really well. Brittney Karbowski does a good job in matching that in the English dub, which is definitely competent overall. I’m not sure if it’s just the American accent but in quite a few of the characters there’s a rustic tinge to the way they say their lines which really works with the setting. So, no matter which language you prefer, you’re still getting a good experience. This MVM release comes with all 13 episodes of the series across 2 discs packaged in a collector’s edition box containing 12 art cards and 76-page artbook. The on-disc extras are well worth looking at, particularly if you’re into the soundtrack as there’s an interview with composer Kevin Penkin and a behind-the-scenes featurette, giving some interesting details about the composer himself and how the music was made. There’s also a recording of the Episode 1 premiere, and two ‘making-of’ features where voice actresses Miyu Tomita and Mariya Ise join original author Akihito Tsukushi for a tour around Kinema Citrus and an overview of the production process. 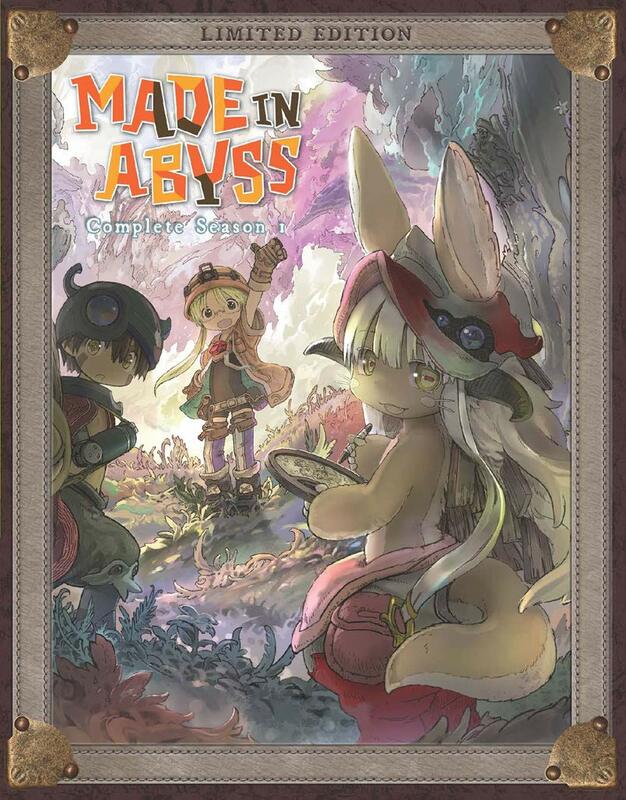 As a whole, Made in Abyss is a very expressive adventure series that really plays to the genre’s greatest strengths. The light-hearted beginnings deceptively settle you down and make its dark twists and turns so much more impactful as you realise how dangerous this adventure actually is, while the expansive world building, lush visuals and superb soundtrack make you feel like you’re really there, sucking you into the depths of The Abyss with Riko and Reg. It may not be perfect; the rush to get to specific plot points stops you from seeing all that the world has to offer and the visits back to Orth break the immersion slightly; however, this is a series that I really enjoyed and I would heartily recommend it to anyone. A sadly underwhelming follow up to a solid first season, The Heroic Legend of Arslan: Dust Storm Dance is largely a waste of time.